The beach is the home of the Australian summer and a great place to spend the day with friends and family. However, we all know the dangers of too much sun and this can be a factor in cutting short an enjoyable day at the beach. When it comes to protecting yourself or your family from the harsh Australian sun, a good beach umbrella is one of your best options. It's important to look for quality in a beach umbrella as there are plenty of below-par options on the market that are unlikely to last more than a few outings. 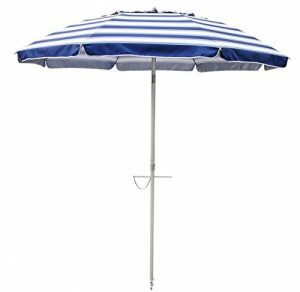 Below we review what we consider to be the best beach umbrellas in Australia and award the amazing Companion Beach Umbrella the top spot. In addition to industrial equipment, Companion Brands design and manufacture a range of high-quality outdoor products. You can therefore take comfort in knowing that no shortcuts have been taken in making this high quality, great looking umbrella. 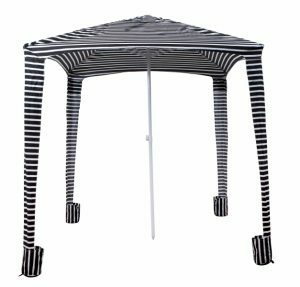 The 2m canopy is vented to improve wind resistance and has a UV silver coating providing SPF50+ sun protection. The pole is made from lightweight powder coated steel to maximise strength and it also features a locking mechanism to assist with height adjustment. 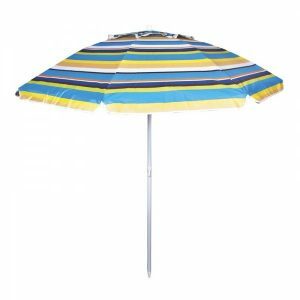 The height of the Companion beach umbrella is 1.8m and it comes with a handy carry bag. An awesome beach umbrella that should last you many years, we are happy to recommend this as the best beach umbrella in Australia. Australian owned Beachkit pride themselves on offering quality beach gear at affordable prices. 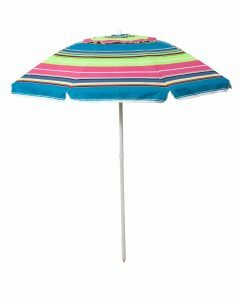 The day-tripper beach umbrella is one of their top sellers. 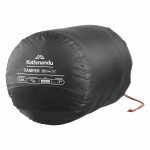 The canopy is oversized at 2.1m and is made from 420D Oxford Polyester mildew resistant fabric with silver coating, offering 50+ UV protection. Beach kit include here a unique self-anchoring system, along with a vented canopy, both minimising the chances of wind problems. There are three alternative shade positions available by utilising the clever tilt feature. Carry bag is included. A great looking, high quality, umbrella, backed by Beachkit’s 2-year replacement warranty on manufacturing defects. The Oztrail Cabana-Brella provides that extra amount of shade for long hot days at the beach - perfect for small groups or families. The square-shaped canopy is 2m x 2m and is made from 160D polyester fabric. It includes a vent to assist with wind resistance and also to allow heat to escape. The Cabana-Brella utilises corner sand pockets for stability and comes with a handy carry bag. Another great option with a slightly more affordable price tag, the Oztrail Sunshine presents a great mid-range option. Like the Companion, the Oztrail Sunshine features a 2m diameter vented canopy to reduce the impact from wind gusts. It also includes a plastic tilt function so you can stay in shade no matter where the sun is in the sky. The canopy is made from silver coated polyester while the pole is steel. Carry bag is included. A great beach umbrella from one of Australia's favourite affordable outdoor equipment brands.